La Guelaguetza [gel-ag-Get-zah] is an indigenous cultural festival that happens each summer in Oaxaca Mexico, that gorgeous area south of Mexico City whose long western border runs its finger along the coast of the Pacific Ocean. In Oaxaca, there’s a melding of indigenous cultures, each with their own unique traditions and dialects. (Zapotec and Mixtec are the most populous ethnicities.) La Guelaguetza dates back to pre-hispanic earth-based religious celebrations, long before the arrival of the Spanish. It remains a fixture in contemporary Oaxaca as a tourist attraction and link to deep cultural roots, and it’s felt to be pivotal to the survival of these important indigenous cultures. The celebration is marked by traditional dances, and of course includes delicious food and beautiful music. 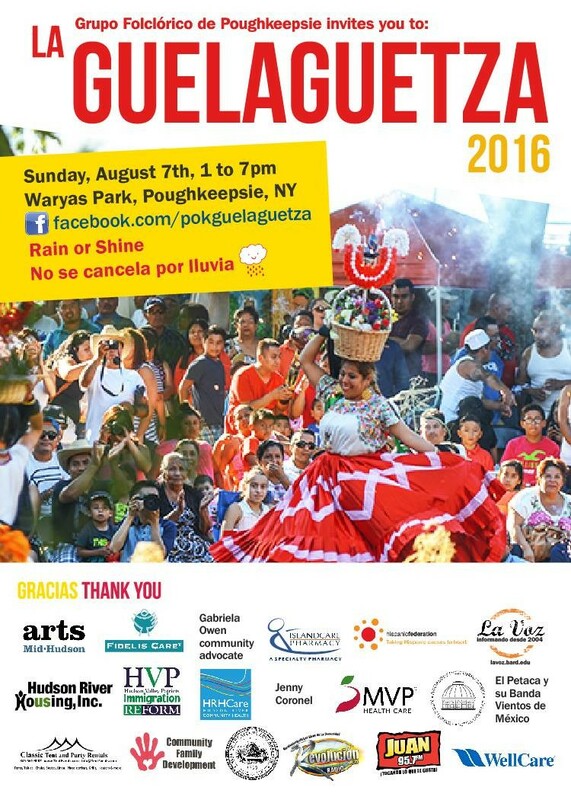 And for the eighth year this August, Grupo Folclórico de Poughkeepsie is bringing La Guelaguetza to Waryas Park in Poughkeepsie, to share the tradition with locals. Poughkeepsie’s La Guelaguetza promises to be vibrant with traditional colorful costumes, food and craft vendors, handicraft workshops, and children’s activities. The Corn Coddess will lead a parade to open the event. Folkloric dance performances by Banda Vientos de México, Ballet Folklórico Mexicano de Nueva York, and DJ Son Rumba y Salsa, among others, will happen throughout the day on the main stage. The Eighth Annual “La Guelaguetza” Festival at Victor C. Waryas Park on Main Street in Poughkeepsie, Sunday, August 7th, 1-7 pm, free! The event is bilingual and happens rain or shine. Find more information and updates on Facebook and read more about the origin of La Guelaguetza in Poughkeepsie on La Voz.